French red morocco, with gilt floral borders and spine in compartments gilt, ca. 1800, and with blue silk endleaves with gilt dentelles, g.e., in a fitted red morocco case gilt. Melvin R. Seiden Collection, 2009. Illuminated for the young man depicted in the final miniature; the O intemerata is in the male form. The man may well have been German, to judge from the Calendar which uses a different ink for its ruling and which was therefore presumably supplied to the specifications of the first owner. It is also notable and probably significant that in the Calendar Bernard's name is written with the German spelling, Bernhard; tiny initials 'TMW' and 'IW' inscribed in an English (?) hand in the corners of first and last leaves, which may suggest that the volume was acquired by the former in 1849 and given to the latter in 1856; Hannah D. Rabinovitz of Long Island, New York, with her circular gilt red leather booklabel (most of her manuscripts were acquired in New York in the late 1940s (Supplement to de Ricci, pp.412-4) and were dispersed by Stonehill in 1960); John A. Saks (1913-1983); his sale (London, Sotheby's, July 8, 1970) to a well-known continental collector; sale (London, Sotheby's, June 18, 1991, lot 134); sale (London, Sotheby's, December 6, 2001, lot 86). Artist: Master of Nicholas von Firmian. Collation: 123 leaves (last blank), i⁶, ii⁶⁺³, iii⁶⁺¹, iv-ix⁶⁺¹, xi⁶, xii⁶⁺¹, xiii-xiv⁶, xv⁸, xvi-xvii⁶, xviii⁶⁺¹, xix⁶, all full-page miniatures on the added sheets, a few traces of catchwords. Decoration: 7 full page miniatures, 28 small miniatures, capitals in designs of liquid gold on red-brown grounds, illuminated initials in scrolling acanthus designs in colors heightened with liquid gold, and illuminated borders throughout. Ms. book of hours for the use of Rome written and illuminated in the southern Netherlands or northern Belgium, probably in Bruges, ca. 1500. 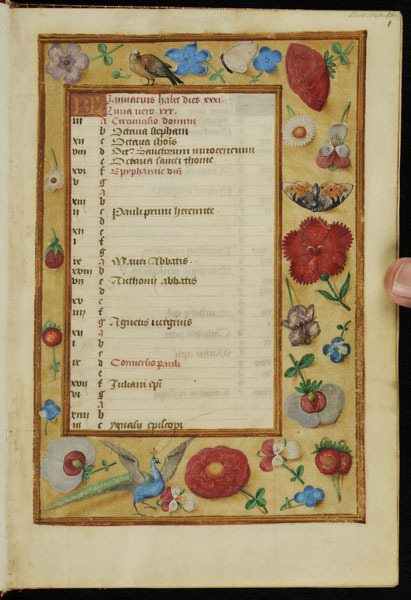 Texts: Calendar (fol. 1r), with a large number of Germanic saints (including SS. Boniface (5 June), Felicula (13 June, Cologne, Trier, etc. ), Willibrord [in error for Willibald] (7 July, Eichstadt), Bernhard [in error for Bernard] (21 August), Herculianus (5 September, Bamberg, Paderborn), Gall (14 [in error for 16] October), Florenetius (16 October, Trier), the 11,000 Virgins (21 October, Cologne, etc. ), Hubert (3 November, Cologne, Trier, etc. ), Othmar (15 [in error for 16] November)); the Hours of the Holy Ghost (fol. 11r); Mass of the Virgin (fol. 14r), with Gospel pericopes; Hours of the Virgin, Use of Rome, with Matins (fol. 22r), Lauds (fol. 29r), Prime (fol. 36r), Terce (fol. 39r), Sext (fol. 42r), None (fol. 45r), Vespers (fol. 48r) and Compline (fol. 53r), with Salve Regina (fol. 56r) and Ave mundi spes Maria; Penitential Psalms (fol. 60r), with the Litany and collects; Office of the Dead (fol. 73r); prayers to Christ (fol. 93r), to archangels, and for use at Mass;15 O's attributed to St. Bernardinus (fol. 99r) preceded by a rubric promising salvation to all who use it, as written on a certain tablet behind the High Altar of St. Peter's in Rome; the Verses of St. Bernard (fol. 100r) and other prayers, including one worth 12,000 years' indulgence, another worth 2000 years' indulgence, as promised by St. Boniface at the request of King Louis of France; O intemerata (fol. 105r) and Obsecro te; Stabat Mater (fol. 108r) with an offer of 100 years' indulgence granted by Pope John, and other prayers; suffrages to the Trinity (fol. 112r) and to many saints (including Christopher, mentioning "...michi famulo tuo N. ...") and to a guardian angel. The subjects of the full page miniatures are as follows: 1. fol. 7v: Crucifixion -- 2. fol. 10v: Pentecost -- 3. fol. 13v: Virgin Mary and Christ Child attended by an angel choir -- 4. fol. 21v: Annunciation -- 5. fol. 59v: David in prayer -- 6. fol. 72v: Three living and three dead -- 7. fol. 113v: Trinity enthroned; the subjects of the smaller miniatures are as follows: 1. fol. 29r: Visitation -- 2. fol. 36r: Nativity -- 3. fol. 39r: Annunciation to the shepherds -- 4. fol. 42r: Adoration of the Magi -- 5. fol. 45r: Presentation -- 6. fol. 48r: Massacre of the innocents -- 7. fol. 53r: Flight into Egypt -- 8. fol. 113r: St. Michael -- 9. fol. 113v: John Baptist -- 10. fol. 114r: Apostles Peter and Paul -- 11. fol. 114r: Apostle James -- 12: fol. 114v: Evangelist John -- 13. fol. 115r: Sebastian of Rome -- 14. fol. 115v: Christopher of Lycia -- 15. fol. 116v: Anthony -- 16. fol. 116v: Martin of Tours -- 17. fol. 117r: Nicholas of Myra -- 18. fol. 117v: Stephen Protomartyr -- 19. fol. 117v: Laurence of Rome -- 20. fol. 118r: Anne -- 21. fol. 118r: Mary Magdalen -- 22. fol. 118v: Catherine of Alexandria -- 23. fol. 119r: Barbara of Nicomedia -- 24. fol. 119v: Margaret of Antioch -- 25. fol. 120r: Apollonia of Alexandria -- 26. fol. 120v: Susanna -- 27. fol. 121r: All Saints -- 28. 122r: Young man before his guardian angel. Written space 105 x 70mm, ruled in purple ink, written in dark brown ink.